Cut off a piece of willow, construct a whistle and blow through it – this is as close as it gets to a perfect combination of the roles of musician and instrument maker. Although this kind of playing has not always been considered as music, folk wind instruments have gradually taken their place among contemporary folk music instruments. A lone shepherd leads his cows to graze. He blows into a horn to keep wild animals away, but also to communicate with other shepherds. He sits down under a tree and plays his flute, just for his own enjoyment. Shepherd culture is often considered a thing of the past. Master instrument maker and musician Rauno Nieminen remembers his time as a cowherd as recently as the 1960s and ‘70s, playing Beatles and Bob Dylan songs to the cows on his guitar. He learned from his mother how to make a willow whistle and eventually got interested in building flutes, inspired by Paroni Paakkunainen and the Karelia Ensemble, as well as Chilean refugees and their instruments. Over the years, Rauno Nieminen has built hundreds of different instruments and played them in many groups. In addition to wind instruments, Nieminen has worked on new versions of the kantele and the jouhikko (see articles in FMQ 2/2009 and 3–4/2015). His solo album Sarvella, due to be released soon, is the first Finnish recording featuring the folk horn as the main instrument. Many Finnish and Karelian folk wind instruments represent ancient instrument types. Finnish flutes have traditionally been fairly simple, with finger holes becoming more common from the 17th century onwards. In Karelia, folk clarinets with a cane reed were known since the Middle Ages, and they have also been played on the west and south coasts of Finland. The birch bark horn was a common trumpet instrument in both Finland and Karelia. The goat’s horn was adapted as an instrument in south-eastern Finland in the 16th century, being the first melodic wind instrument that could be played throughout the year. In Karelia, where goats were not commonly kept, horns were made out of wood instead. 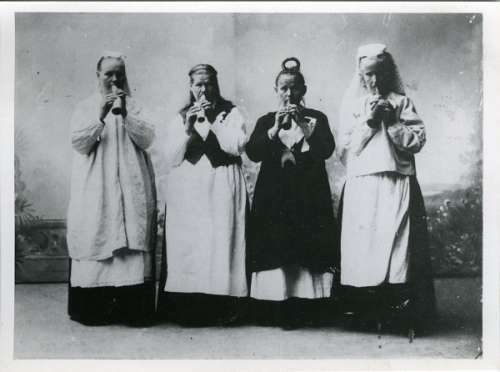 Four Karelian women playing folk horns in 1900.
c) South Karelia Museum archives. “When there are no instruments, there are no players either. When we have no information about these instruments and their music, we have neither instruments nor music,” says Rauno Nieminen, who has striven to rectify the situation. Over the years, he has built instruments, played them, run numerous instrument-making workshops and edited sheet music. The late professors Martti Pokela and Erkki Ala-Könni were important sources of inspiration and support from early on. Emeritus Professor Timo Leisiö’s research has also been an invaluable resource for Nieminen. “The fact that shepherd instruments, the jouhikko and the kantele are still played today is due to the efforts of only a handful of people! Pessimistic predictions about the extinction of shepherd music culture have been voiced for the past hundred years,” Nieminen sighs. The bulk of what has been written about Finnish shepherd music is connected to the legendary Ingrian musician Teodor “Teppo” Repo (1886–1962). He was a significant figure in his own right but he also played a part in the making and romanticising of Finnishness – the last shepherd player from an oppressed sister nation. Despite of the shared Finno-Ugric heritage, Ingrian music culture was distinctly different to Finnish music culture. “Folk music scholar A. O. Väisänen was on the lookout for a shepherd music player, but failed to find a good one in Finland as the playing here tended to be insubstantial. But in Ingria he found Repo, a fine composer who had been a shepherd player in his youth, but also played in a military band. In other words, he was a trained musician, although this side of him was intentionally kept in the dark,” Rauno Nieminen explains. Finnish folk music collectors of that time showed little interest in wind instruments or shepherd music. Today, folk wind instruments are the most marginal of all marginal instruments. Players and instrument makers are few and far between. The World Mänkeri Orchestra, established in 1984, and the goat’s horn ensemble Pukinsarven Tröötöttäjät are some of the groups promoting folk wind instruments. Instruments have also been actively developed to meet contemporary musicians’ needs. Some of our significant contemporary masters of folk wind instruments include Leena Joutsenlahti, Kurt Lindblad and the current Professor of Folk Music at the Sibelius Academy, Kristiina Ilmonen, who was the first folk wind instrumentalist to receive an Artistic Doctorate. As part of her degree, she and Nieminen devised a new kind of a pine flute specifically for concert performance. “Without professional players, the instruments will not keep evolving,” Rauno Nieminen points out. “Shepherd instruments are simple artefacts that date back thousands of years. Today’s players need to be able to practise every day and play concerts that last for a full hour! If you look at a symphony orchestra, for example, each instrument is the product of a long evolution”. Recently, many players have sourced their instruments from other Nordic countries as well, often because there is no other choice. “In Finland, the private use of goat’s horns is no longer allowed: the EU has forbidden it due to mad cow disease,” Rauno Nieminen explains. “Some time ago, there was a performance of Pehr Henrik Nordgren’s compositin Taivaanvalot (The Lights of Heaven) which is written for chamber orchestra and folk instruments. A month before the performance, it was discovered that there were no goat’s horns to be found! The only option was to make new ones, and so I started phoning through a list of goat farmers, hoping one of them had kept old horns. I managed to find one, and tracked down another one from Norway!” But life is not easy for Norwegians, either. Last year, Norwegian wind instrument player Karl Seglem had to resort to a crowdfunding project to allow a pair of goats to live long enough for their horns to grow to a decent size. Kirsi Ojala and Mimmi Laaksonen play together in two ensembles, Wind on Wind and Armas. How is everyday life for a young folk musician who has chosen folk wind instruments as her main instrument? One of the implications is having to constantly lug around a case full of different instruments. “Whistles and flutes are also fairly quiet instruments,” Ojala continues. “The wooden horn has the necessary volume, but it’s impossible to cover two octaves or to play in two different keys…” Their joint ensemble Armas was born out of the wish to examine the Ingrian shepherd tunes collected in 1914 by A. O. Väisänen and published in 1985 in a book entitled Karjasoitto. The book is a rare treat for wind instrument players as the sheet music is written out specifically for their own instruments. “Instead of simply replicating the tunes exactly as they were played, we arrange them in a contemporary way,” Kirsi Ojala explains. The ensemble Wind on Wind, established by Ojala (read more: FMQ 1/2014) is one of a kind: an ensemble consisting solely of folk wind instrument players. Most of their instruments are made in Sweden by Gunnar Stenmark. This year, the ensemble has begun a collaboration with a group of kindred spirits, the Swedish wind ensemble Zephyr. Main photo by Ayumi Nakamura: musician and master instrument maker Rauno Nieminen among his wind instruments. WoW - what a sound!